In the dead of night, a gang of thieves crept into the King of Benare's elephant-house to plot their next job. Their leader had already carried out more than a hundred violent crimes. Now he described to his friends his plan for breaking into the royal treasury to steal all the King's jewels. what happens if someone comes along while "In doing the job?" the our line of work you've got to thief, anyone who get in be prep Now, the your way, the leader repl thought King's favourite elephant heard all this and him the that the criminals had come there to t his right way behave. So, next morning when up keeper came to feed him, he picked the poor man in his mighty trunk and threw him to the floor near And he attacked anyone else who tried to get him eventually, the others keepers had toss ropes around him and tie him up to stop him doing any more my chief. When the king was heard about this, he was very upset. He was very fond of the elephant, which er up to that time had always been well behaved. "It really would break my heart to have to put him down, he told his, ministers, shaking his head 'I can't understand what's got into him. 306 The king then sent his wisest minister to the elephant-house to see whether he could find out anything. The minister he could find out anything The minster looked around carefully and, in the straw youcBSeeSu that was scattered on the floor, he found something that the thieves had left behind. Aha!" he exclaimed. "Very useful clues!' And he hurried back to the palace. What seems to have happened. Your Majesty, he told the king, is that the elephant was led astray listening to criminals who were meeting in the elephant house 'What can we do then to set matters right? the king asked. "I suggest we put good men in the elephant's stall and have them sing the parises of gentleness, patience, kindness and generosity," the minister replied. That may lead him back into decent ways. 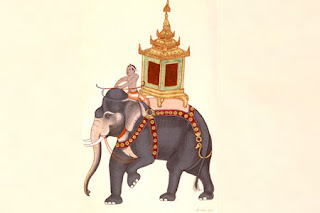 "Let it be done then," commanded the king So a group of honest men sat in the elephant's stall about talking about good things for several weeks. The elephant pinned back his great ears and listened carefully. He now took his lesson from what they they had to say and for the rest of his life he was the nicest, kindest, most gentle animal you could hope to meet anywhere.